The PR10 Roof is a tower based structure with a pitched roof. This pitched roof has a standard cantilever and a special PA frame at the sleeve blocks of the front towers which can carry a PA Load of 3.000 kg each and is a working platform to slide in the outer keder canopy. 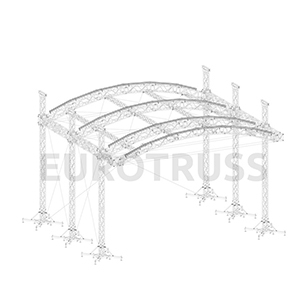 The arched roof structure consist of standard HD/FD34 mast truss sections on special small bases with integrated jacks and a few special corners to fit the triangular FD/HD33 arches. The AR20 Roof is a Tower based Structure constructed of three Arches and a Cantilever Arch on six TD35 Towers. The Arches are made of standard straight truss sections with hinges and have a keder profile on top to fit the canopy. This Tunnel Roof carries great features like an impressive free clearance of ~7,5m, an integrated cantilever of ladder truss and a clamped on keder tent profile for its canopy that guarantees full closing and allows you full flexibility in depth. The Tunnel Roof consist of standard HD44 straight truss sections and carriers great features like an impressive free clearance of 9m (29,5ft) and an integrated cantilever of ladder truss. The S-R20 Roof is designed to be set up on single steel bases or can be set up with integrated bases (ballast safes) in any kind of steel scaffolding stage. The SR30 Roof consist of a ST Ground Support on four TD35 Towers and a Roof Structure of ST Truss. The PR30 Roof is a tower based structure with a saddle roof. Available in 14x10m and 12x10m all on four TD35 Towers. The SR50 Roof consist of a TT Ground Support on eight TD44 Towers and a Roof Structure of ST Truss.